Sorry, Mr. Armstrong, what you wrote about Ukraine is not the Truth at all, it’s just YOUR truth , and/or that of your contributors. Living in Europe, we know very well EU is totally against the people : many people here think this (we are less and less influenced by the lined up media, you know?) and also think that in Ukraine the Germanic-driven EU, together with the imperialistic USA as usual, are behind the rioters, and financing them, just as they did in Lybia, Egypt, Syria, etc.. So now you are just posting propaganda, and losing your credibility. I’m very disappointed for this, because I held you in great consideration, but still hoping you can revise your opinion : maybe you can just try to find some impartial source….. REPLY: The question was HOW did this begin. This is the same movement against government corruption that is rising from Argentina, Brazil, China, Thailand, Turkey, Bosnia, Spain, even New York City and many other places including financial markets that the USA will do nothing about. Corruption is the trend in this cycle and it is NOT restricted to Ukraine. This is the same root cause as the Occupy Wall Street. Corruption is the common link and Ukraine is no exception. Corruption has plagued the human race since ancient times. It is like a Shakespeare Play – the words and the plot remain the same from one century to the next – only the actors change. Bribery was so extensive during the elections in the Roman Republic of 53BC, it caused interest rates to jump. It was the schemes of 1869 that led to the term Black Friday because they were dragging bankers out to the streets and hanging them. Corruption has been the Fourth Branch of government. The USA did NOT fund this event as it did not fund the others. Syria was argued for Saudi Arabia for the Pipeline not because of any other nonsense of noble causes. Ukraine was not even a consideration for they assumed it was joining Europe. Nevertheless, I have stated that Ukraine is strategic from every side. I have stated that Ukraine is a DIRECT confrontation that is totally different from Syria or any other event. HOWEVER, will the “rebels” end up being funded if there is a civil war – YES. Were they funded to begin to occupy Independence Square – NO. I PERSONALLY know people involved as was the case if Cyrus. So I need not read the press to tell me how this began. I have direct sources for that. I reported on the corruption BEFORE the riots began. 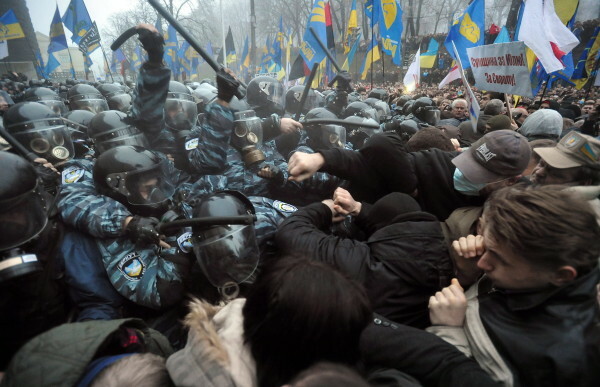 This crackdown is directed by Russia and the “riot police” are mercenaries who do not speak Ukrainian. Regardless of HOW it began, this will evolve into a DIRECT confrontation and the USA will most likely end up funding the people. Ukraine is the focal point. Had they been funding them from the beginning, there would have had weapons. This action now has justified that funding, which will be seen in the months ahead. I respect your view but you should realize that is the propaganda from Russia just as there is propaganda from Europe that paints them as the savior. The issue began as corruption. We have FOUR people from Ukraine not just one and none knew the other. So what I report is from the ground. It may be a view you disagree with, but it is not propaganda put out by any side. This will evolve into funding rebels no doubt. However, it did not begin that way and it was not even something anyone considered as remotely possible or needed in Washington.